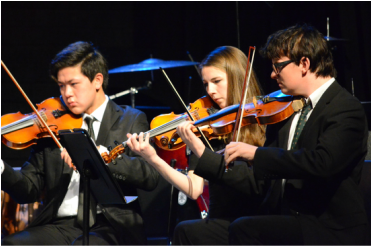 The Marin School of the Arts Foundation is the nonprofit organization responsible for raising the $500,000 needly annually to support MSA operations, above and beyond the welcome support provided by the Novato Unified School District. Now in its 13th year, MSA continues to thrive thanks to the hard work, vision, and generosity of many individuals, parents, business partners, and foundation grants secured annually by the Foundation. We invite you to experience our signature fundraising event, SHOWCASE2018! The MSA Foundation presents Showcase each year, featuring many of our talented students from each MSA discipline and bringing the MSA community together in celebration of our students' and faculty accomplishments. The event is open to everyone—from the community at large and our MSA families to our generous donors and supporters— as we embrace the importance of arts education in helping to shape our future, be they leaders in society, business, or art. Showcase aims to bring in $50,000 in donations, which is only 10 percent of the Foundation’s $500,000 fundraising goal. Every gift, every sponsorship, auction purchase, and ticket sold helps us achieve this critical goal. We invite you—as a lover of the arts, a parent of an MSA student, a community leader, or a philanthropist—to help us reach this goal during this magical evening April 28, 2018 at the Osher Marin Jewish Community Center in San Rafael. Every donation helps the Marin School of the Arts provide arts education to our students. Thank you for believing in MSA and please join us for our annual fundraiser SHOWCASE2018!! MSA is funded by the Novato Unified School District (NUSD) and the MSA Foundation. Facility needs—including improvements like the state-of-the-art dance studio constructed in 2014.